The material on these pages is a key resource for this course. Do not expect to absorb it all on one visit. You will find yourself returning here several times. The best way to understand this is to have an initial read through, then take what you understand and use it to reflect on one or two of the key readings (some in particular will be recommended to you). Then return to it, go more deeply into the ideas, think of your own examples, and so on. You will be expected to make clear reference to the key texts here in your final portfolio and, generally, to locate your portfolio work with reference to these ideas. I will admit that this time round (semester 2, 2013-14), the M&IL course unit is taking place at a point of transition. Before I started out writing my new book (see the literature page for more information), which I was essentially doing from January – August 2013 (with occasional breaks…), I expected these ideas to be central to it. As it turned out the book does still use them, but much more in the background. The whole M&IL course is changing in 2014-15, once the new book is out and can be used as a text, and this section of the materials will be substantially updated. But I am not saying that what is here is no longer relevant. 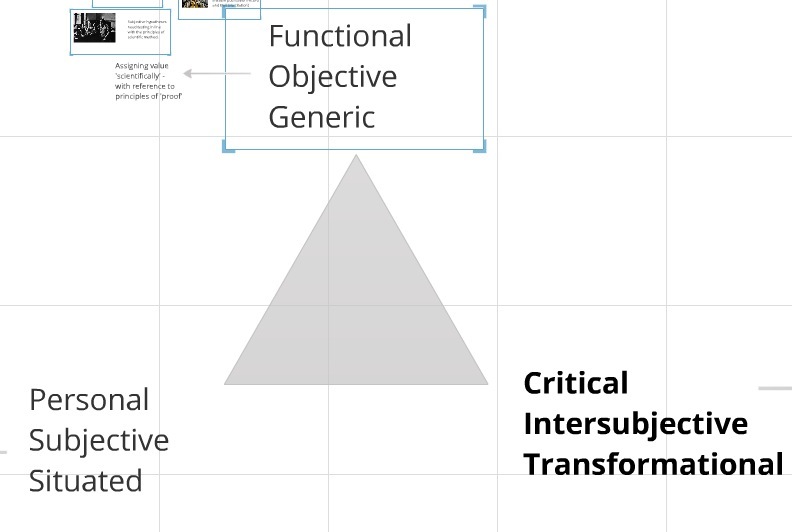 I still think that this three-fold, or “triadic”, model of informational relationships is a useful way to classify the different cognitive authorities we use in our information practices (see the activity as linked). I first wrote about the differing forms of value, which come into play in our relationships with information, in Chapter 2 of “Information Obesity”; though this is only now one part of the model, which brings the work of other authors into play such as Christine Bruce et al‘s “Six Frames of Information Literacy” and work by Kieran Egan (see the main reading list). The philosophical basis for the model is found in Brian Fay’s brilliant little book, Social Theory and Political Practice (1975, Allen & Unwin), though unfortunately the full text of that book does not yet appear to be online. Anyone interested in the heavy theory behind this should definitely try to find a copy, however. Failing that, if you want more detail, try this additional extract from “Information Obesity” (pp. 109-119). The model is intended to show how different ways of valuing information, processes involved and locations for this work, must all work together to allow a productive, sustainable relationship with information whether for individuals, organisations, communities, science, and society as a whole. If any of the elements are omitted, specific problems arise. Thus, any form of literacy teaching which omits consideration of one or two sides of the triad is incomplete. Explore the pages below, each of which contains a Prezicast introducing that side of the triad and a few pieces of supplementary material. As with most of the rest of this site, do not feel obliged to look at these in any particular order.